Extra-large home for perfect family retreat! 9 Bedrooms and 6 full Baths with private pool and an elevator. 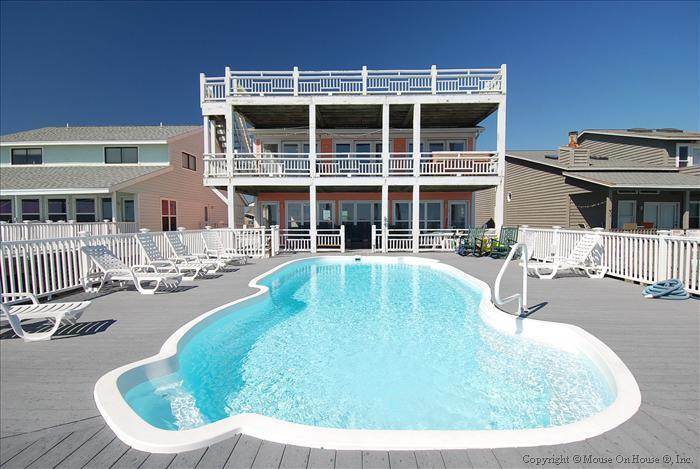 Pool is elevated pool (for the best ocean views!) and can be heated for an additional $75/day. Open Living and Kitchen area facing out to the ocean. Amenities include 2 televisions, 2 DVD players, 2 dishwashers, washer/dryer, microwave and wet bar with beverage fridge and stand-alone icemaker. Ceiling fans in living room and bedrooms, fireplace, wireless internet access, 2 highchairs, 2 charcoal grills. Covered porch, sundeck, elevator, and outside shower. Downstairs bedroom has an elevator and bathroom making it handicap accessible. Non-smoking, no pets allowed. First Floor: Down, Queen, Queen, Double/Double. Second Floor: Double/Double, Double/Double, Double/Double, Double/Double, Queen and Double/single. This is a Blue Ribbon property. All beds are made upon your arrival and bath towels provided for your stay. OIB has been THE vacation spot for my entire family going on close to 40 years. Over the last couple of years we have stayed in three separate smaller condos and would then congregate into one of them to spend the evenings together. Needless to say, we outgrew this arrangement! This was the first year that all of us (over 20!) stayed in the same condo. We were a little leary of what to expect but our worries were quickly assuaged! Perks: 1.) The HUGE table allowed all of us to sit down to dinner together (a vacation first! ); 2.) There were plenty of chairs out on the deck for everyone, 3.) the elevator made moving in and out a breeze, and made getting up and down the stairs for some of our older family members MUCH easier; 4) PRIVATE POOL!!! this was, hands down, the best part of the whole experience. We also loved being able to see the ocean from the deck. CONS: 1.) The house is definitely in need of some TLC and general up keep (i.e paint on the outside, weeds in the parking area, updated bathrooms, etc. ); 2.) While the kitchen was well stocked with lots of useful equipment, there was really TOO MUCH stuff as a whole, it made it somewhat difficult to find things and to store any of the items we brought ourselves; 3.) no central bathroom available on either floor.